Although the March revenue forecast increased estimated state revenues for the 2017–19 and 2019–21 biennia, the House Appropriations Committee Chair proposed a new capital gains tax along with his 2019–21 operating budget. The Senate is also considering a capital gains tax, although in this case the proceeds would be used to reduce other taxes rather than to increase the operating budget. Additionally, a capital gains tax would certainly be challenged as an unconstitutional income tax. Even if it were eventually found to be constitutional, a court case would likely mean that any revenues would be suspended until after 2019–21. Building the budget around such a tax would be risky at best. That about sums it up: volatile, most likely unconstitutional, and unavailable in the near term to support the budget or for tax relief. But don’t stop with the summary. HB 2156 and PSSB 5961 would both im-pose an excise tax for the “privilege of selling or exchanging long-term capital assets.” HB 2156’s 9.9 percent rate would tie Oregon for the third highest top marginal rate on capital gains in the nation.PSSB 5961’s 8.9 percent would rank sixth highest. In both cases, the tax would apply to asset sales occurring on or after January 1, 2020. The constitutional challenge is unavoidable. Both bills frame their capital gains taxes as excise taxes. A number of legal experts believe that a capital gains tax is inherently an income tax rather than an excise tax. The fact that the value taxed on the state return is taken from the taxpayer’sfederal income tax return would lend common sense support to such a claim. If the capital gains tax is an income tax, the 9.9 percent rate in HB 2156 and the 8.9 percent rate in PSSB 5961 would conflict with the state constitution, which sets a 1 percent cap on the tax rate that can be applied to property: In 1933 the state Supreme Court ruled that theWashington state constitution’s very broad definition of property encompasses income and, therefore, that all constitutional restrictions on property taxes apply also to income taxes (WRC 2015). Beyond that – and that, we understand, is quite enough – there’s the matter of the volatility of the revenue stream from capital gains taxes. This WRC chart comparing capital gains with sales taxes makes the point. 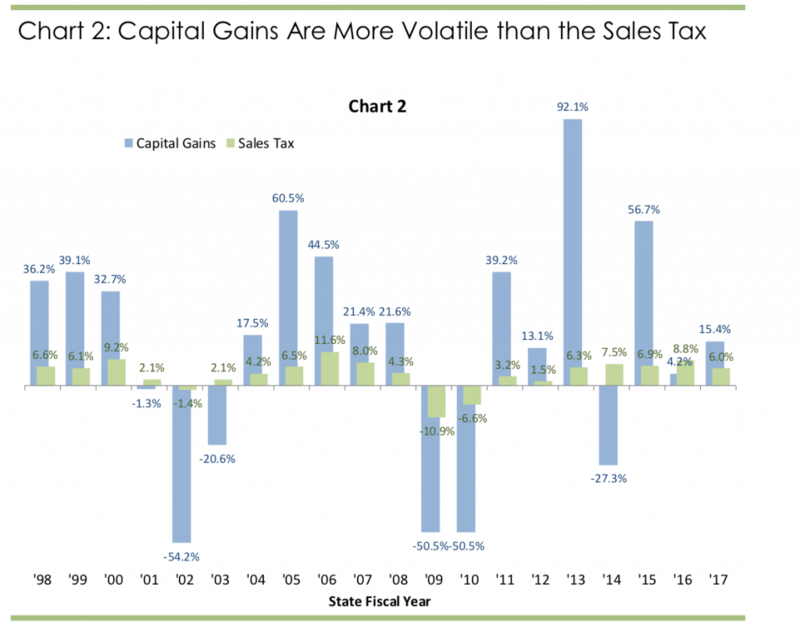 In percentage terms, the swings in capital gains are much bigger than the swings in state sales tax revenue. Moreover, the two are highly correlated: in each of the three instances where sales tax revenues were lower than in the preceding year, capital gains decreased by more than 50 percent. A shaky fiscal foundation. So far, neither chamber has brought the issue to a vote.